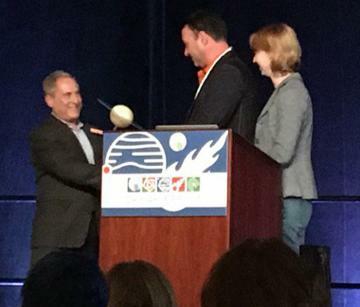 New Horizons Principal Investigator Alan Stern (left) accepts the Cosmos Award for Outstanding Public Presentation of Science from the Planetary Society’s Jim Bell and Emily Lakdawalla during the AAS Division for Planetary Sciences and European Planetary Science Congress joint meeting on Oct. 17. Principal Investigator Alan Stern and the team behind NASA's New Horizons mission received the Cosmos Award for Outstanding Public Presentation of Science. The Planetary Society presented the award Oct. 17 at the joint meeting of the American Astronomical Society Division for Planetary Sciences and the European Planetary Science Congress in Pasadena, Calif. The historic 2015 flyby of Pluto by the New Horizons spacecraft culminated in a bonanza of remarkable imagery and other scientific data, generating headlines worldwide and setting records for both the farthest planet ever explored and arguably the largest public engagement of any NASA science mission in history. "We worked very hard to broadly engage the public in the thrill of exploration, and we are very proud of that success," said Stern, from the Southwest Research Institute in Boulder, Colo.
"The work to engage the public throughout the history-making New Horizons Pluto system flyby and subsequent phases of scientific discoveries excited the global community and fueled public interest for space," said Jim Bell, president of The Planetary Society board of directors, in a blog posted Oct. 12. "Through spectacular first-time photographs and storytelling, the New Horizons team sparked massive public interest not only of Pluto and its moons, but also in the excitement of modern scientific exploration in general." The New Horizons flyby culminated on July 14, 2015, when the spacecraft came to within 7,800 miles (12,500 kilometers) of Pluto's surface. Onboard instruments collected historic images and science data on Pluto and all five of its moons, revolutionizing knowledge about the entire Pluto system. Since then, NASA has approved a mission extension enabling the spacecraft to travel nearly two billion miles beyond Pluto into the Kuiper Belt, an ancient area of icy bodies and small planets at the far reaches of the solar system. This new mission will study the Kuiper Belt environment and more than two dozen Kuiper Belt objects, and will make a close flyby of one Kuiper Belt object known as 2014 MU69 on Jan. 1, 2019. Stern and the Johns Hopkins University Applied Physics Laboratory in Laurel, Md., manage the mission for NASA. "I am humbled by The Planetary Society's recognition of our work through its Cosmos Award, and I'm particularly honored for us to stand with previous Cosmos Award honorees like Stephen Hawking and James Cameron who have so effectively communicated the excitement of space exploration," added Stern. The mission team has been honored multiple times for its work leading to the exploration of Pluto. Stern was named one of the TIME 100 most influential people in the world in 2016 (his second such designation) and received NASA's Distinguished Public Service Medal, the American Ingenuity Award of Smithsonian Magazine, and the American Astronautical Society's Carl Sagan Memorial Award. Other recognition for New Horizons includes the National Air & Space Museum Trophy for Current Achievement, the American Astronautical Society's Neil Armstrong Space Flight Achievement Award, and the Aviation Week and Space Technology 2016 Laureate Award for space exploration. New Horizons also was named among the top science news stories of 2015 by Science magazine, Discover magazine, and Science News. The team has earned more than two-dozen awards to date.